WE ALL NEED TO RECOGNIZE WHERE OUR FOOD COMES FROM. This is more important than ever in a time of climate change. If we want to have delicious, nutritious food on our table, we need to consider planting a simple garden on our property where we can grow our favorite foods. We also need to support our local Farmer’s Market and local growers – organic if possible, but certainly all who try to grow healthy, nutritious food for our community. Carlisle’s own Clark Farm, Sweet Autumn Farm, some national seed companies are providing free seeds for you to try in your own garden. This means you may pick up a small sample of a new seed variety. The purpose of the Seed Swap is not to supply a complete set of seeds for your garden, but to introduce you to new varieties to experiment with. The event is free, with no registration required. It’s Saturday, March 24, Union Hall of First Religious Society; swap/learn from 4-6, dinner 6-7 PM. 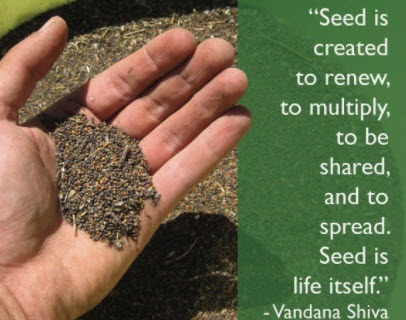 You do not need to bring seeds to swap – but we promise, in years to come, you will want to! Bring a supply of used envelopes and a pen, if you wish, to make notes about the seeds you collect at the Swap. Next fall, if you save seeds from a favorite crop you grow, then bring them to next year’s event or share with a friend, that would be fabulous! You can learn more about this at the Seed Swap. MAKE YOUR OWN ORIGAMI SEED ENVELOPES! ​You can craft attractive seed envelopes for the seeds you collect at the swap. Just start with a 6" (for small) or 8 1/2" (for large) square of colored paper (or a square cut from a an old seed catalog, gardening magazine, a brown paper bag, wrapping paper or even newsprint -- anything that works for you). Fold as shown in steps 1 to 4. Insert seeds; make stick-on label with name of seeds and date acquired -- plus anything else you want to remember. Fold free tips into outside flap as shown in step 5. Turn over and stick on label. Children and adults alike can enjoy our hands-on workshops on seed starting, seed saving, and some current horticultural ideas -- such as seed-starting outdoors in gallon milk-jug containers, sowing in snow, and growing nutritious vegetable sprouts or microgreens. There will be information on supporting pollinators, creating native habitats, and much more. You’ll find books to check out from local libraries and links to good online info. One long-term possibility is to set up a Carlisle seed library, where you can borrow seeds to try – not just at the annual swap, but throughout the growing season. We’d love to get your opinions on that. Last year was our first attempt at a community-wide event. We saw many of our leading “plants-persons” swapping ideas on what works and what’s tough. That’s the kind of dialog that helps us all. And new gardeners are born every day. They’re looking for your advice and suggestions. This is your annual opportunity to schmooze with other growers. It’s all connected. We'll have good info available for free at the swap. Here's a quick, free sample. A few years back, a naturalist/scientist, Douglas Tallamy, gave an inspiring talk in Carlisle sponsored by CCF. Doug was then the author of Bringing Nature Home and has since co-authored another wonderful book, The Living Landscape, with renowned garden writer and photographer Rich Darke. The Garden Club subscribes to the ideas laid down in these texts, along with tips for natural habitat preservation espoused by local non-profits such as GrowNative Massachusetts. See, for example, http://grownativemass.org/programs/expertsvideos/dtallamy for a video of Doug Tallemy’s talk.